Crisp, cool mornings as fall arrives may not mean wondrous autumn leaf colors in this part of Texas, but there are other offerings. 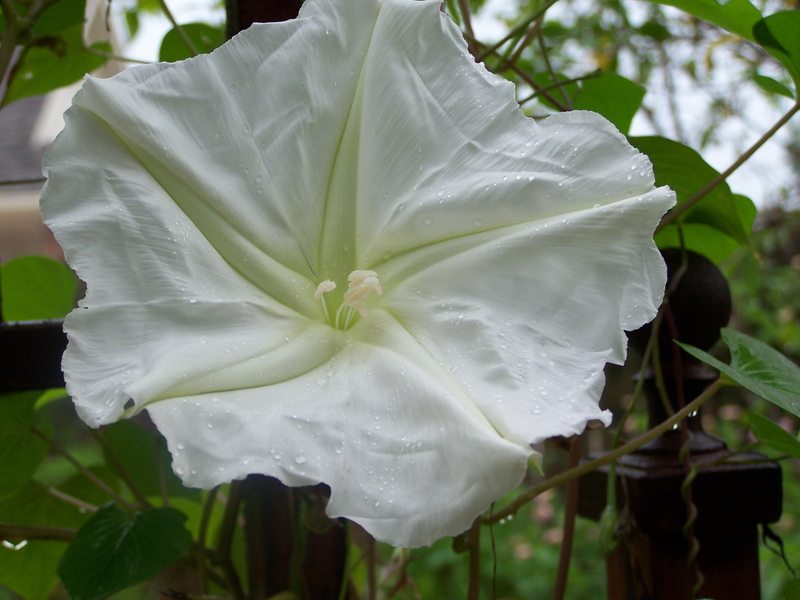 My moonflower vines, which flower at night, stay open considerably past dawn. Their saucer size tissue paper blooms are veined with pale yellow…lovely! Skye and Maddie helped me plant the seeds last Spring. One of our favorite books to read together is Jan Karon’s The Trellis and the Seed, a story of patience and faith about a small moonflower seed. “Just because something is broken doesn’t mean it’s no good. Doesn’t mean you throw it away. It just means it’s broken, and broken is okay…broken is still beautiful, still works…, and at the end of every day and those to come, I can love broken.” Page 242, Maggie, by Charles Martin. A little feather was a reminder to me for years. I don’t remember where I found it or exactly when, although for a long time I kept it in a little birthday reminder book that was given to me in 1987, the year we moved to Indonesia. I put it there in the beginning because on that page there is a drawing of that same feather, right down to the size (tiny) and colors and markings (black and white). I was amazed at that. Usually the process is different…you find the object, then obtain or make its resemblance. The other special thing about that feather is that it lived between the pages of the birthday calendar book where my oldest son’s name is written, January 13. It stayed there, through 2 moves in Jakarta, an international shipping, and 3 moves back in Texas plus all the shuffling of my kitchen desk here. Feathers usually don’t stay. They drift in and blow away. But this little feather stayed between the pages and always caused me to smile when I came upon it. It reminded me of joy in small things, of hope, of lines of poetry and scripture, and that gifts can come when you open your hand and heart, and sometimes, the door. This year on January 13, I gave the little feather for a birthday gift.